In areas where permanent fencing is not required, a mesh fence can solve your safety concerns. Mesh fence panels are installed side by side with gaps between poles that are too small for children or pets to get through. Additionally, the mesh design of this type of pool fence is constructed with small weave-patterned holes that allow visibility. Mesh fences are one of the more inexpensive solutions and can be removed and stored away if no longer needed. The most popular type of surrounding fence is referred to as a vertical bar fence. This type of fence comes in a variety of materials, providing different levels of privacy. The fence specialist installing your fence must be well-versed in code and local guidelines. Children and pets should not be able to squeeze between the bars or go under or over them. Ideally, gates should be self-closing and have a child-resistant locking mechanism. 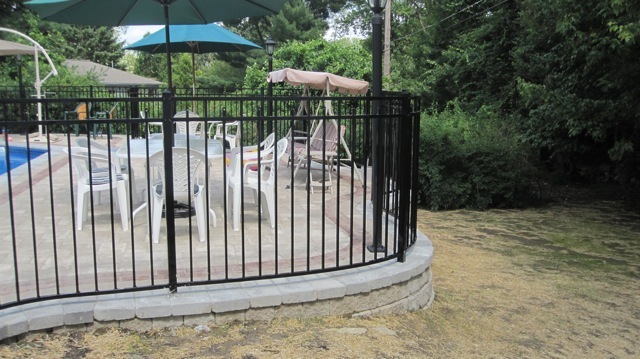 A vertical bar pool fence can be constructed of steel, aluminum, wood, vinyl or other strong material. Although more costly than other options, a glass panel fence can provide a full view of the pool area if privacy is not a principal concern. Glass panels can give your outdoor space a modern and sophisticated look while providing protection. This type of fence is extremely durable and weather-resistant, though it needs to be cleaned frequently to maintain the look. Framed or unframed panels are available. 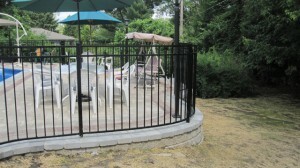 With the pool fence options available today, finding a solution that is right for your property is easier than ever. Regardless of the choice you make, you should be able to obtain your security and privacy goals.